If you have been following Digital Health news then you’ve probably heard about wearable tech. Wearable devices are a form of data collection that provides new sources of understanding patient behavior. Having the ability to track your health data through a wearable device and then quantify it is expected to help drive better outcomes in health care. 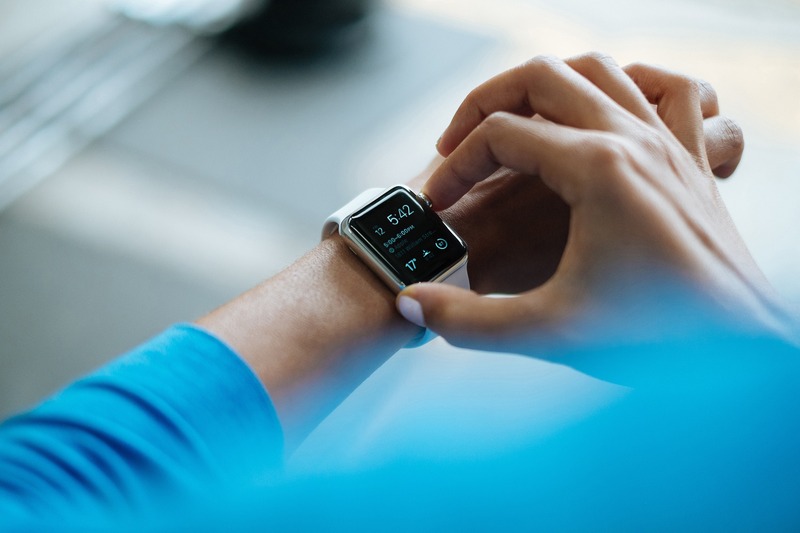 Are wearable devices and mobile health apps really helping with patient engagement? Let’s examine a few reports and studies to find out. According to IMS Institute for Healthcare Informatics, there are over 165,000 mobile health apps with approximately over 2 million in both major apps stores. Thus, mobile health apps represent about 8% of the market. If we break down the pie, you’ll note, that Wellness apps represent 65% of the market with mHealth apps focused on fitness holding 36% of this market. Wearable devices and wellness app go hand in hand as most popular fitness trackers also have an app. It has been predicted by Stephanie Tilenius from Kleiner Perkins Caufield & Byers that 30% of the consumer market will be using wearables to track wellness and other vital signs. It’s worth noting that many wearable devices are being used for Disease & Treatment Management. 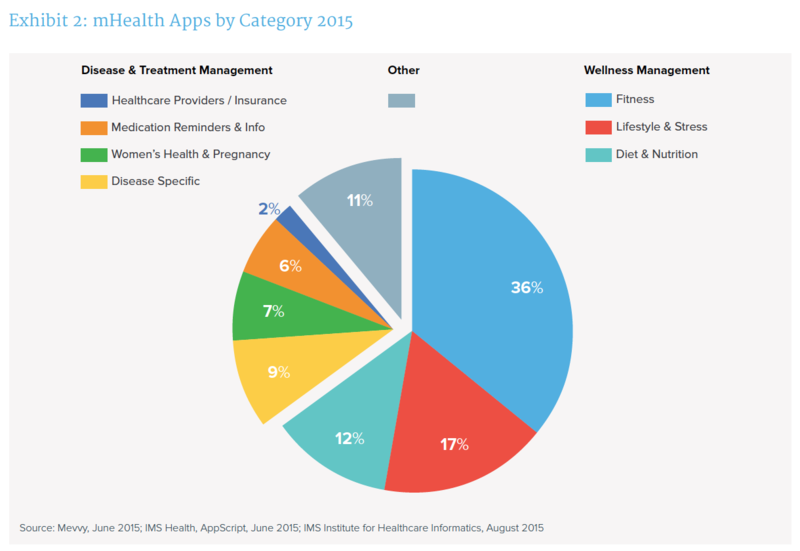 Second to Wellness Apps, Disease & Treatment Management Apps represent 24% of the market of apps. 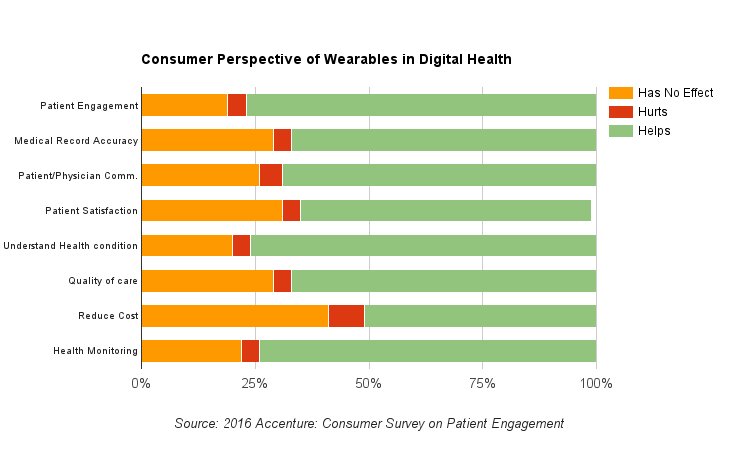 A recent study by Accenture on Consumer Patient Engagement helps provide a better view of what patients and physicians expect of wearable technology in Digital Health. In a study of 2,225 doctors, 85% of the doctors believed that wearables would help with patient engagement. In a prior article on How patient engagement and health literacy worked together, we shared the idea that true engagement happens when patients can understand the information to them. The data shows that doctors also have similar ideas concerning wearables. When it comes to increasing quality of care, 62% of doctors believed wearables could help with 66% believing that it would also help understanding health conditions. Doctors were somewhat pessimistic on wearable devices reducing cost. 43% believed that cost would not be affected. 21% believed that cost would actually rise with newer technologies. Compared to doctors outlook, consumers appear more optimistic about how wearable technology will help them. 77% of consumers believe wearables would help Patient Engagement and 74% believe it could help with monitoring the health of others. Another 76% believe it would help them better understand their conditions and 69% believe it could help their relationship with their doctor. Similar to doctors, consumers were skeptical that wearables would reduce how much they had to pay. 41% of Patients believed it would have no effect. 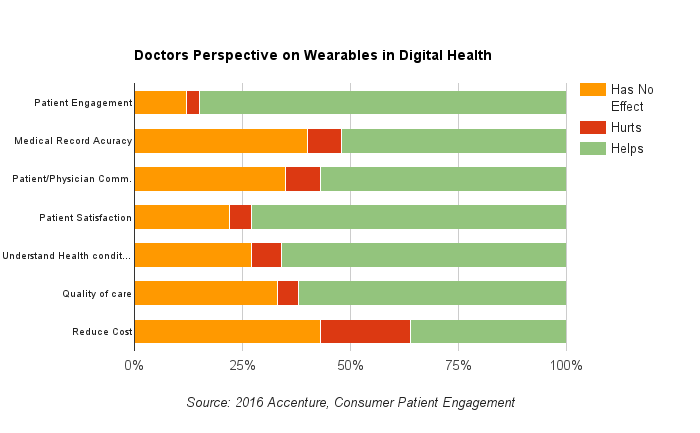 The two categories both doctors and consumers believed wearables would affect the greatest are Patient Engagement and Understanding Your Health Condition. Both categories also shared the same outlook that wearables wouldn’t reduce cost, but would increase patient satisfaction. Why does this matter? The way doctors and consumers perceive wearables can change the current state of the market. In a Fitness study by the University of Pittsburgh, they found that wearable devices, when given to 470 people, lose less weight as compared to their peers under same conditions who did not use a wearable device. The problem is when technology seems to work in theory, but doesn’t actually create positive outcomes for people. Our app covers 27% of the mHealth mobile app market. We have tested our solution in the Diet & Nutrition market and operate in the inpatient setting. So do wearables help with patient engagement? 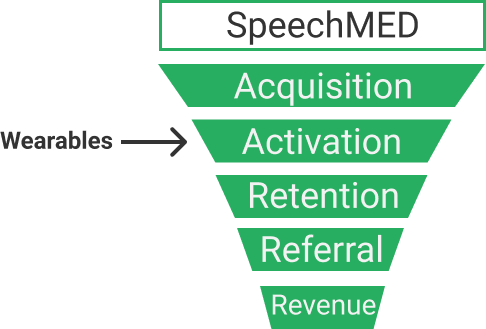 Using the AARRR funnel here is how we see it. We see wearable devices at the activation stage of engagement. True engagement focuses on retention and creating better experiences. 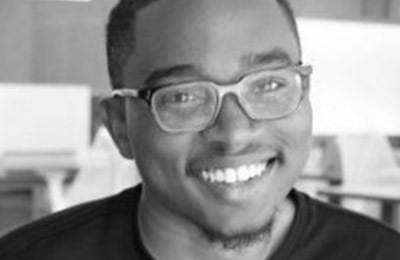 We see strategies like designing for people and conducting ongoing experiments/pilots as major keys for defining your solution to deliver positive outcomes. For us, a pilot with South Miami Hospital did years ago was crucial for assessing the impact of our engagement platform in bedside ordering. Growing self-tracking movements communities like Quantified Self are good breeding grounds for pilots, and ongoing testing to monitor if your solution is working. We believe that as Digital Health continues to grow and evolve that results and positive outcomes will be in question even more. While mHealth app market like Fitness may face its challenges we believe these same challenges will be faced in the area of Disease & Treatment management. Are you looking for a proven mHealth solution that can help your care team or organization? Feel free to contact us here. Interested in Digital Health news? Follow us @SpeechMED or subscribe to our channel to get more updates on Mobile Health.